CEDAR FALLS --- Floyd Winter knows firsthand just how much some Cedar Falls graduates appreciate their education. When he worked in the administration building they dropped by his office to share their stories. Now, they stop him on the street to tell him. But they rarely knew just how to give back to the schools that did so much for them. Until now. For nearly one year a volunteer board, headed by Winter, has been working to establish the Cedar Falls Community Schools Foundation. And now, it is ready to share its work with the community. "I have been devoting a great deal of my time to this, because I can see so much good coming from it," Winter said. 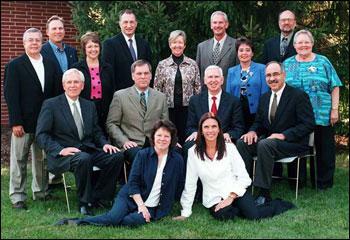 The board hopes to secure $1 million in donations and pledges over the next three years. To date, they have about $50,000 guaranteed in pledges over the next five years. The foundation also will accept money that is specifically earmarked for a department, like science or music. "Everyone that I have talked to has been so positive. I think what people really see is that everyone wins," said Cindy McDonald, a board member and the district's director of elementary education. "People know this is for the right reasons. It really speaks so highly for the Cedar Valley that we have so many generous people here." For now, the foundation is focusing its efforts on student scholarships, but as the donations roll in the money also will become available in the form of grants for teachers and district staff. Winter said students could begin receiving scholarships from the foundation as early as this spring. "We will do what we can with what we have," he said. Board members are doing what they can to plant seeds around the community, but are hoping to secure even more support during a kickoff event Oct. 29. Board member Marlene Behn said the group will reconvene after that event to determine the best way to move forward. The move likely will include more one-on-one chats with potential donors and more public events. While large gifts are appreciated, Winter said no gift should be considered too small. "For us, it's about upholding the tradition of excellence. That has been a longtime motto for the Cedar Falls schools and having been a part of that, I feel a real responsibility to that motto," Winter said. In the future, Winter hopes the foundation can expand to include a paid director's position, but for now, he said, all money is being funneled directly into the giving pool. At that point the board also could put some of its focus on developing comprehensive alumni lists that would serve as a guidebook of potential donors and make planning class reunions a little easier for those who chose to take them on. Contact Emily Christensen at (319) 291-1570 or emily.christensen@wcfcourier.com. When: Oct. 29, 5 to 7 p.m.
--- Donate cash, securities, real estate, life insurance or personal property to the Cedar Falls Community Schools Foundation, 1002 W. First St., Cedar Falls 50613. --- Build an endowment by including the foundation in your estate plans. --- Pledge money over an extended period of time, up to five years. --- Make a donation in honor or memory of someone.